It was a dream homecoming for Evan Polei in every way but one. 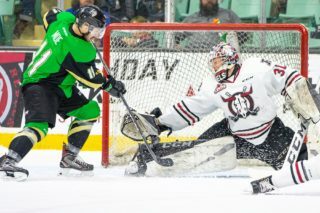 The only fly in the ointment was the Edmonton Oilers’ 6-3 loss to the Calgary Flames in an NHL prospects game played in front of a sell-out crowd at the Enmax Centrium Wednesday night. 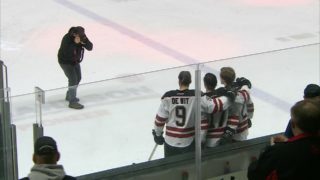 Other than that, the former Red Deer Rebels forward couldn’t have drawn up a better script for his first time performing in front of a Red Deer throng since graduating from the WHL in 2017, scoring a goal and picking up an assist in a losing cause. “It felt great. These fans here supported me for here for four years and I’m so grateful for that,” said the 22-year-old. “I had so much fun playing in front of them again. I didn’t think I’d be back this soon, so it feels real good to play here and get a goal in front of all of them. It’s just a good feeling. Polei assisted on the Oilers’ first goal by Luke Esposito late in the opening period and cashed a rebound during a two-on-one break with Dmitri Samorukov at 14:36 of the second frame, tying the game at 3-3 after the Edmonton prospects had trailed 3-0. 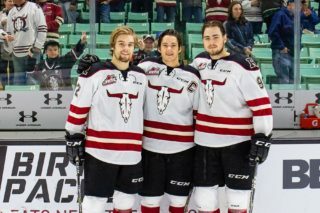 After falling 7-3 to the Flames prospects Sunday in Calgary, the Oilers rookies whipped a NAIT/Grant MacEwan all-star team 9-1 Tuesday in Edmonton. Polei earned a one-year American Hockey League contract with the Oilers following his final season with the Rebels in which he scored 33 goals as an overage player. He split last season — his first as a pro — between the AHL Bakersfield Condors and ECHL Wichita Thunder, scoring four goals and collecting nine points with the Condors and sniping eight goals and adding nine assists with the Thunder. Polei admitted there were adjustments to be made during his initial season of playing for pay, some of them of the domestic variety. “Pro is a lot different than junior, it’s a big leap for when you have to know how to cook,” he said. “If you don’t know how to cook you’re hooped. Coming out of junior your billets do all the cooking for you. 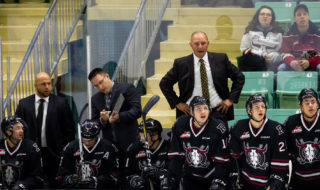 The six-foot, 228-pound winger used his size and strength to his advantage during his time with the Rebels and hasn’t changed his style as a pro. Polei’s goal is to play a complete 2018-19 season in the AHL. “Just a steady year in the American League with the Condors, help them out as much as I can. Go down there and play hard all year and hopefully good things come down the road,” he said. Polei knows he has to improve certain aspects of his game in order to succeed as a pro. Just wearing the Oilers silks is a dream come true for the Wetaskiwin native. 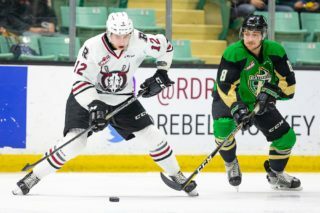 “Wetaskiwin is 45 minutes both ways (to Red Deer and Edmonton) so my family has been pretty lucky with me playing junior here and then signing with Edmonton,” said Polei. Dmitry Zavgorodniy led the Flames with two goals, while D’Artagnan Joly, Brett Pollock, Adam Ruzicka and Glenn Gawdin each scored once for the winners. Cameron Hebig notched the other Oilers goal. Tyler Parsons started in the Calgary goal and stopped 12 of 13 shots before being replaced by Mason McDonald halfway through the game. McDonald blocked 10 of the 12 shots he faced. Oilers starter Olivier Rodrique made 12 saves through 40 minutes and Stuart Skinner stopped 11 of 14 shots in the third period.